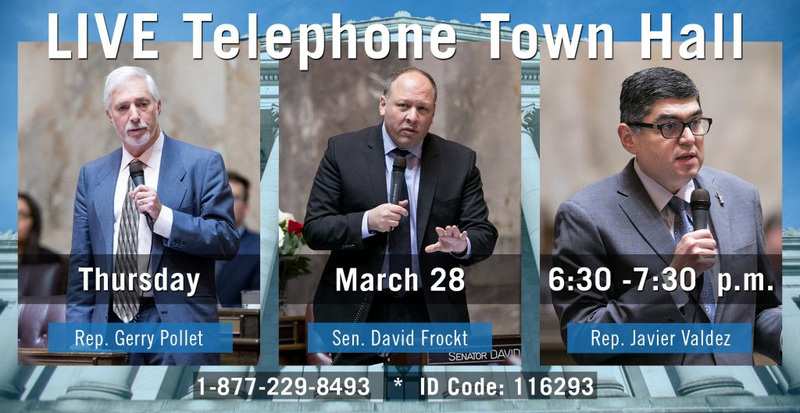 Rep. Gerry Pollet will be holding a Traveling Town Hall this Saturday, March 23, 2019 from 10am to 11:30am at Bagel Oasis 2112 NE 65th St in the Ravenna neighborhood of NE Seattle. We're now in the start of the sprint to create a state budget, while also considering bills that came over from the Senate (and Senate considering bills from House, including my bill to ensure opioid overdose reversal drug naloxone is available in college dorms and high schools). Also glad to discuss bills and issues that affect our neighborhoods, including those that would override Seattle's planning, environmental and social justice reviews for development projects and ADU ordinance. Lawmakers from the 46th District— Sen. David Frockt, Rep. Javier Valdez and Rep. Gerry Pollet — are hosting a telephone town hall on Thursday, March 28. The event will take place from 6:30 to 7:30pm. Constituents may participate by calling in at the time of the event. The 46th Legislative District includes Kenmore, Lake Forest Park, and NE Seattle.